Holy cow, can you believe Christmas is just a week away?! I am getting super excited, and my kids are counting down the days. Life has been crazy busy and I didn't have time to share some of my Christmas projects with you. Dang. Maybe next week? Or after Christmas? Not sure if that works...any way, I do have a fun project from the fall that I shared on My Repurposed Life, where I contribute for the best person ever, Gail!! 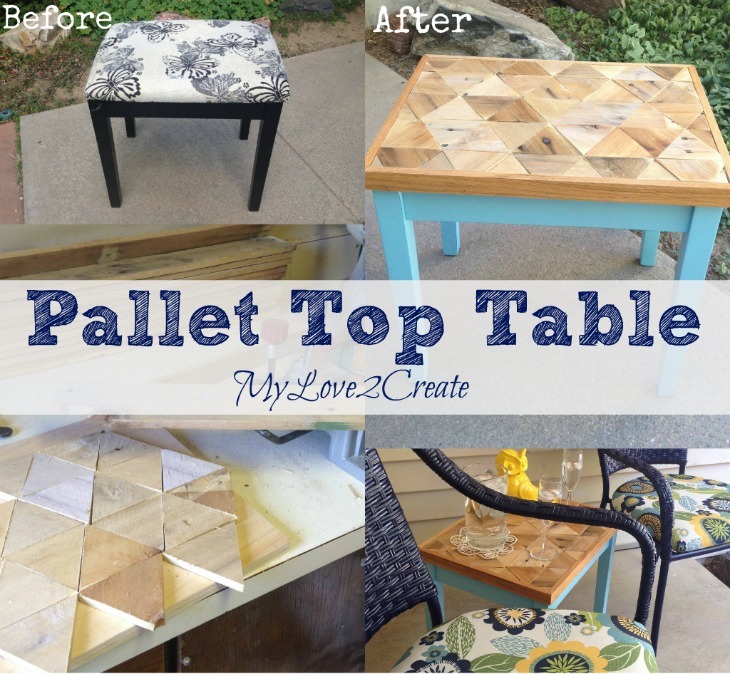 It is my Pallet Top Table, and I love it. 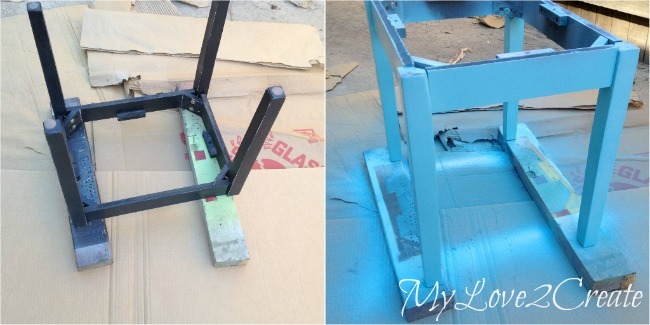 This is a super easy project, I promise! And who doesn't love things made out of beautiful pallet wood right? This was another free find off of Craig's List and it has been collecting dust on my back porch (surprise, surprise). 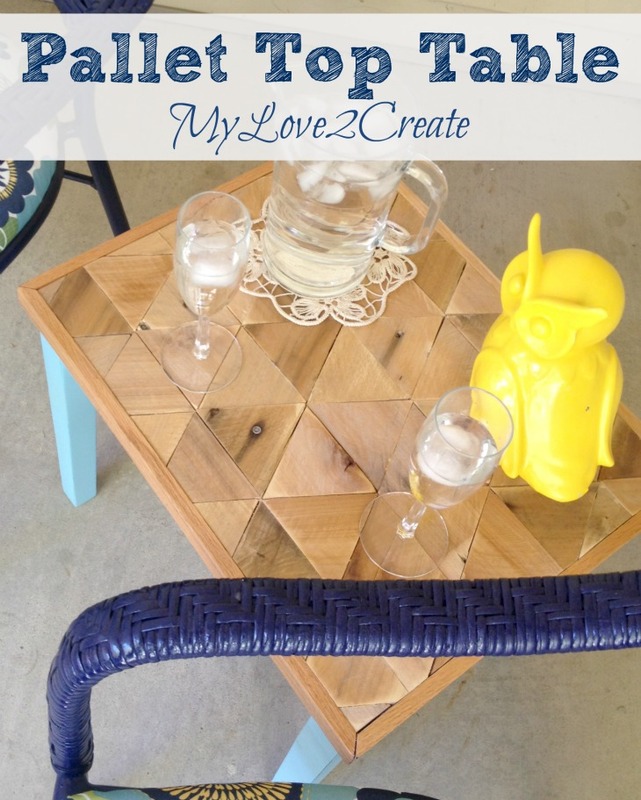 As I walked past it one day I realized it would make a perfect little table to go with my wicker furniture makeover for holding drinks or books. It was pretty wobbly, which is why someone gave it away for free. At least that is my guess, otherwise why would you throw away a cute little upholstered bench for free? It took me a couple minutes to tighten the legs and it was rock solid sturdy. 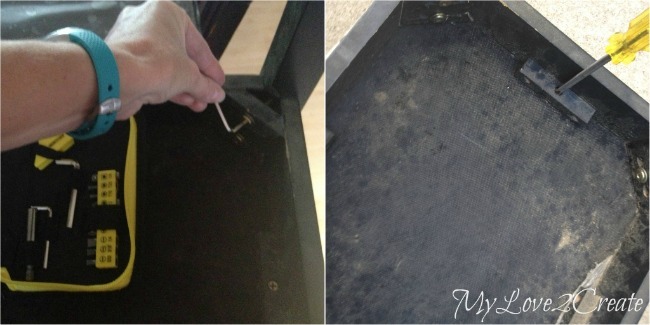 I then unscrewed the seat top. 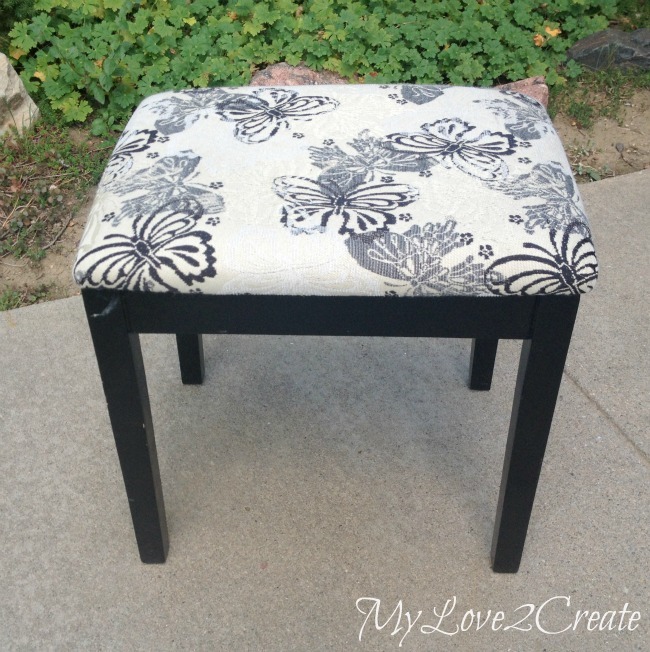 There was NO WAY I was taking off the upholstery just to reuse the wood, instead I used some scrap plywood, because I had some, thank goodness! I measured it to the seat and cut it with my Ryobi Circular Saw . It fit perfectly! I had some pallets that I had broken apart, and the wood was just waiting for a project. I thought it would be fun to try a pattern of some sort and eventually decided on triangles. I set my saw to 30 degrees and started cutting. 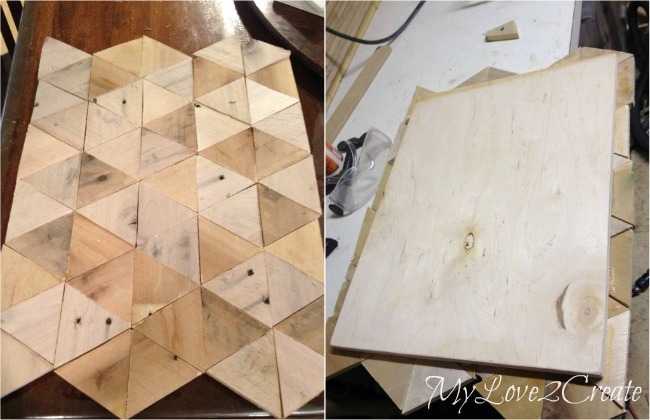 I lined up my triangles on the plywood and cut until it was all covered. Can you see my stack of pallet wood in the back? I still have some left! 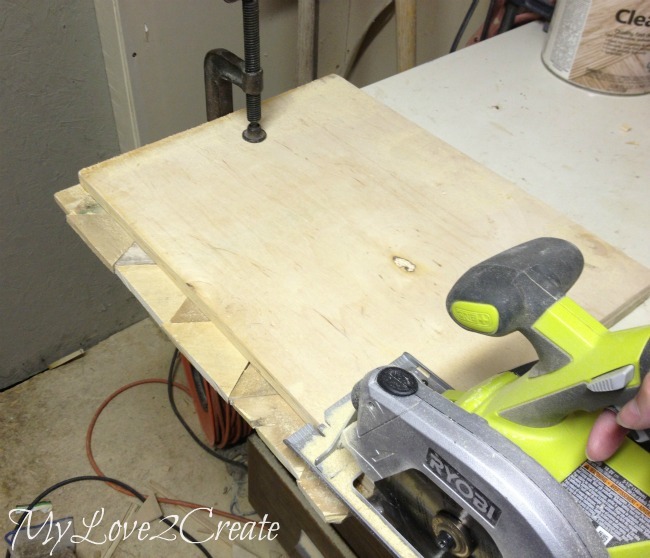 I started with my jigsaw and realized it was going to take for-ev-er, so I busted out my Ryobi Circular Saw again and it went really quick. 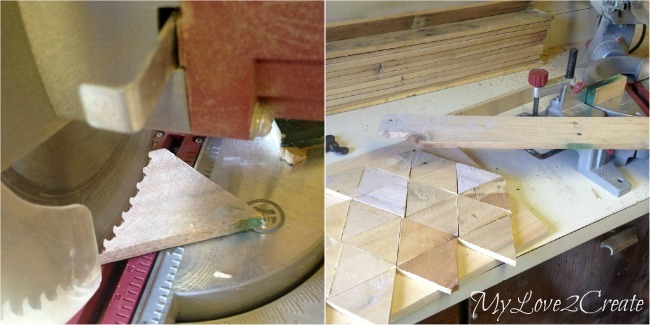 To cover up my edges I used this scrap wood that happened to be the perfect thickness, love it when that happens. I had gotten it free from a cabinet maker years ago, in fact I still have a ton of wood from that gold mine. I mitered the corners at 45 degrees and glued and nailed the edges on, then sanded the whole thing down to make it smooth. I almost forgot the base! I sanded it down, wiped it clean, and sprayed it with a half empty can of Rustoleum's Aqua. 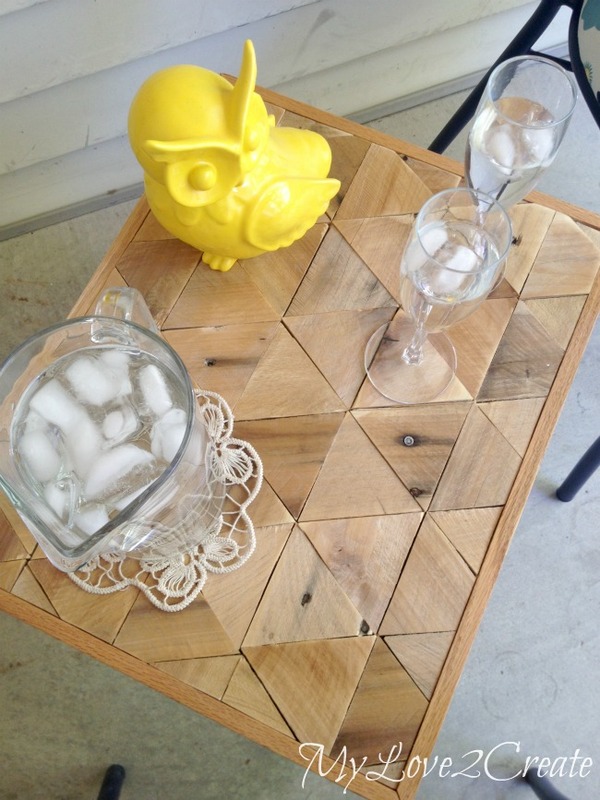 Here she is...my cute little pallet top table! 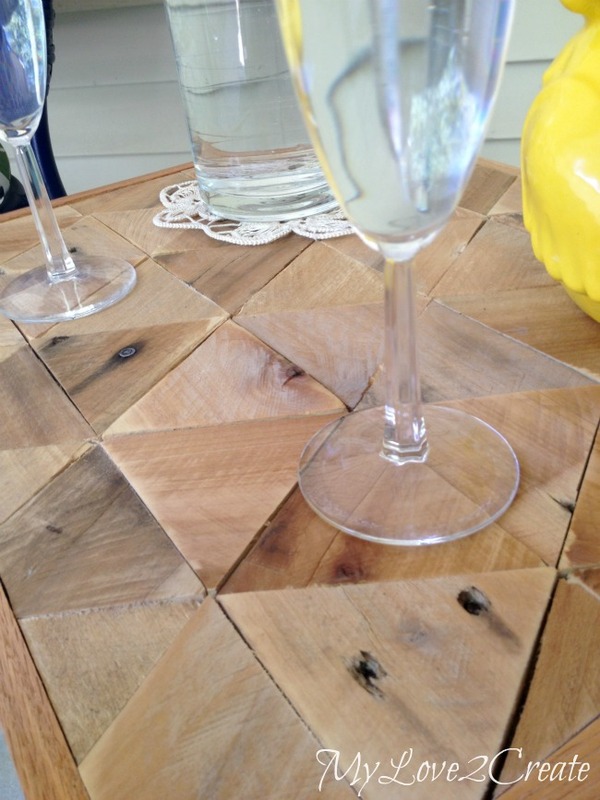 As you would guess, working with pallet wood, it is perfectly Imperfect. I have this little cutie in the house for now, and I smile every time I see it. It was so glad I tried a simple triangle pattern. I think you should totally make one, I promise you won't be disappointed! 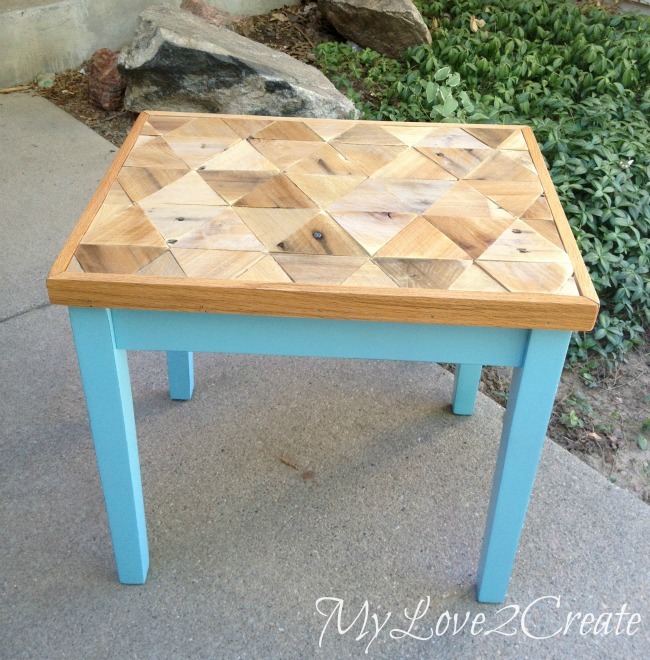 If you don't have a bench to repurpose, why not just add the pallet wood to an existing table? It would be super easy and fun! Super happy holidays to you all! I love patterns and think this is super cool! I did a dresser top in a herringbone pattern once. I sanded the top down to level it out a bit and pushed the sawdust into the gaps. 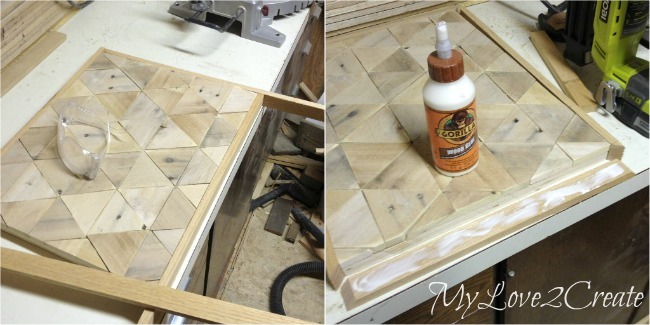 Then I put a couple clear coats on top to seal the sawdust in place.. 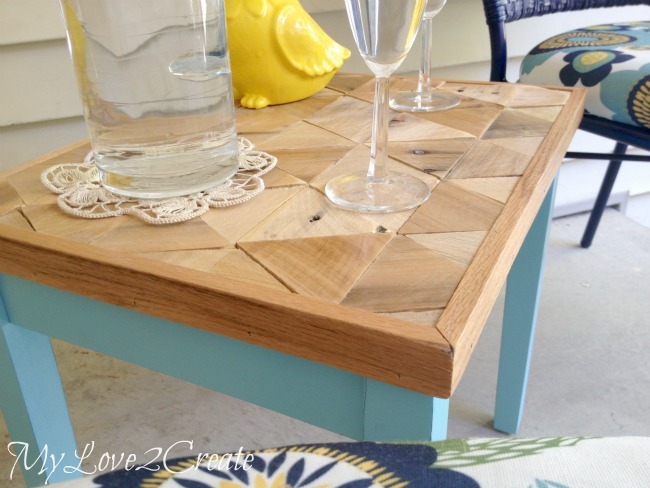 Still love this pallet top table--so charming! Pinning! 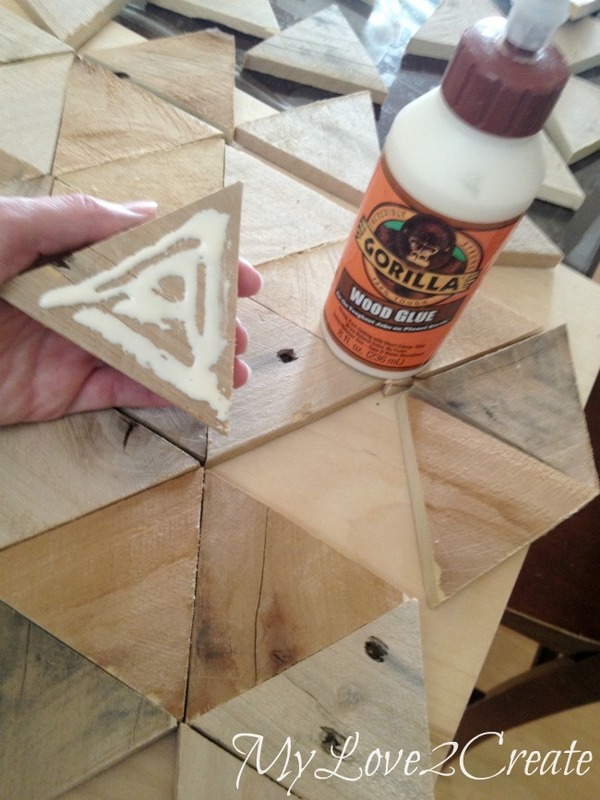 The triangle pattern is so awesome! I love each and everyone of your projects, Mindi! Love the wood patterned top and your transformation is amazing!